Today we will be making some ambient FX soundscape. We will use FM8 amazing filter capabilities and look into key scaling technique. This is technique is very important in FM synthesis, since you can control output of any operator relative to pitch of a MIDI note which has great impact on timbre of a played sound. Before we start I very strongly suggest you use a limiter on your audio track. We will be working with high resonance settings and in combination with delay and reverb this can cause some really loud and unpredictable volume peaks and noise bursts which can damage your speakers and more importantly your hearing. So please, monitor the sound at moderate level and use the limiter or if you don’t have one, you can use compressor with very high ratio setting and lowest possible attack. First we will set the effect section. Since we are working on ambiance FX type of a sound we need some generous amounts of reverb and delay. Insert reverb and Delay/Chorus effect in the FM8 Effects page. Set it like in the picture below. Also insert Shelving EQ and cut the highest and lowest frequencies. We will do this to avoid any sudden volume peaks in this region because of the high resonance settings later on. In the Master page of the synth set polyphony voices to 8, Unison voices to 4, detune to 40 and Voice panning to 60. Set it’s Ratio to 2 and audio output to 70. Also set self modulation amount to 54 and Invert the waveform. This will add almost unnoticeable effect later on when we add more oscillators. Set ratio to 4 and choose Parabol waveform. Set audio output to 100 and self modulation amount to 28. Listen to what we have for now. As we can hear, when there are some high notes played in the beginning of the sample high frequencies in our sound get a bit overwhelming. We can fix that in a KeySc page of the FM8. Here you can scale amplitude of any operator and also X and Y modules relative to the notes played. 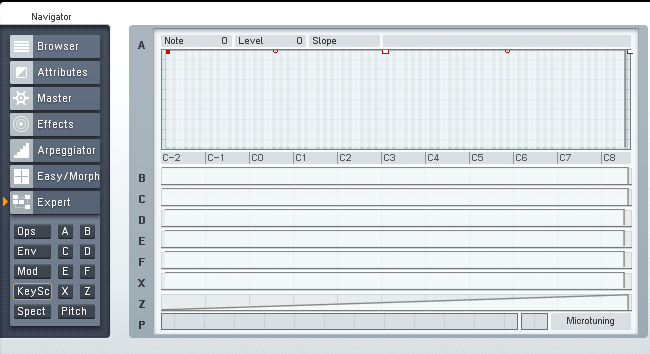 This is very useful feature in FM synthesis in general. Not only it allows you to modulate the the modulator and carrier amounts relative to the pitch but it can also help you in such cases when you need to scale down certain frequency ranges so the sound is playable over the complete range of MIDI notes. Go to the KeySc section of the operator F and E and adjust the envelope so the amplitude of these operators will get lower the higher the note played. You can draw your own shapes and I strongly recommend to experiment with it since it has major effect on sound as you will hear later on. This is sound example with key scaling applied as you can hear the higher frequency are now less overwhelming. Also enable D operator, set it’s ratio to 3.0100 and waveform to 1+2. Set self-modulation value to 21 and audio output to 63. Route operator D to modulate operator E with amount of 23 and also operator F with amount of 63. Set operator E to modulate operator F with amount of 25. You should readjust key scaling for each operator to your preferences. This will have a major effect on sound. Here are four different examples of also more extreme key scaling settings. Go to filter module Z. Set global envelope modulation to -50. Set it to serial routing and Mix to filter 2 output only. Set filter 1 to a value of 0 and filter 2 to 100. Now before we start to play with resonance, we should go to the KeySc of the synth and limit the highest and lowest frequency regions, else there will be some feedback overload at some point resulting in a very loud burst of noise. Set the filter key scale envelope in the KeySc page of the synth like in the picture. Try to copy the envelope settings as accurate as you can. Now set the resonance of filter 1 to 80, and resonance of filter 2 to 85. This produces sharp bandpass filter. Sync the envelope and set a long loop (mine is 16 bars, but you can go a bit shorter) and set it to something like this. Lower your speakers volume at this point. Now route output of operator D to filter module Z at a value of 50. Also route operator F at a value of 100 and noise module X (which we will set in a minute) at 27. Let’s add some background noise now. Go to the mod section of the FM8. Chose sample&hold waveform of the LFO. 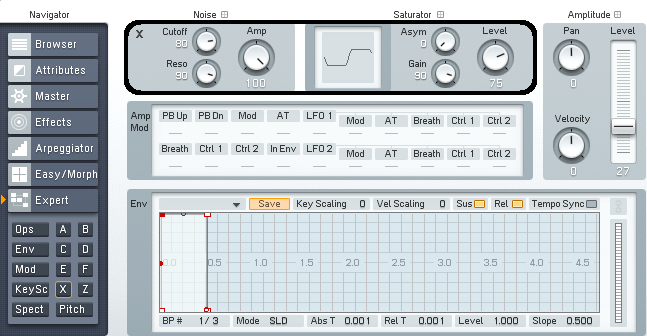 As name suggests this samples a waveform of your LFO and holds the sampled value at the output for the length of one cycle which is set by Rate control of the LFO. This will produce some cool bubble effect on our highly resonant BP filter and we will also use it as an amplitude modulation for operator D which is our main modulator to further animate our sound. Activate LFO1 and enable Sync button. Set it’s rate to 70, Delay to 0, Velocity and Key Scale both to 80. Set LFO modulation amount to operator D at 51 and to Z module to 92. Here we go, you should hear something like this. 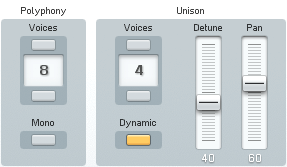 Also be sure to try changing the detune parameter of the operators since it has a very strong effect on sound. Here I’ve changed Brightness parameter in the Easy/Morph page from zero to full during the 32 bars. Brightness controls all the modulation amounts of every operator in a patch. At the end of the sample you can hear almost distorted guitar like timbre. Hope you enjoyed this tutorial. Have fun! !